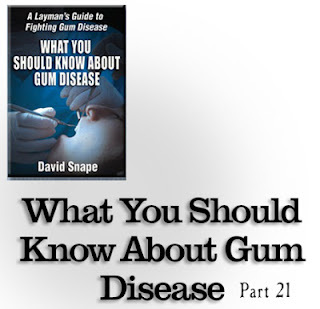 As we continue are series on gum disease whereby I am reading at least the first four chapters and making this video series, I hope that you are able to glean some information as well as see the value of what is contained inside the book: What You Should Know About Gum Disease. Gum disease is truly a widespread problem. If you know you have it, you are definitely not alone. If you don't know that you have, the odds are pretty high that you may have it regardless of whether you have been made aware of it yet or not. A great deal of people remain unaware. We can deduce that as being true because dental professionals tell us that 75% of people have gum disease. Since that equates to about 3 out of every 4 people, I am confident in saying that plenty of people have it and just don't know. I was faced with an expensive treatment that would have cost me about $1600 had I chosen to accept it. Perhaps a little less with insurance, but I am pretty sure it would not have been much less. I was also told that consequence of the treatment would be the need for a special cleaning every time I visited in the future. Of course, that 'special' cleaning would cost more than 'normal' cleanings. I had to wonder if that meant there would be some damage to my gums. What else would require a 'special' cleaning every time in the future. All of this is often bewildering when you are confronted with it initially. You may be overwhelmed first by the news and then by not understanding what is going on. Although I speak in general terms here and specific questions about your dental health should be directed towards your dentist, you might find it helpful to learn the information I have put in this book. Perhaps it could help you to avoid expensive treatments. Since gum disease is the number one cause of tooth loss, perhaps one of the more expensive treatments you could face is the installation of an implant. They can be quite costly and insurance is not likely to pay for much of that. Perhaps, armed with the right knowledge, you could truly turn the tide, safe teeth and avoid a lot of costly treatments. Every human body is different, but it seems to me that you will gain at least something from this book, even in the worst case scenarios. However, it also seems to me that there is a good chance that you could learn some things that could make a major difference in your own dental health. Aside from potentially saving money, time and pain, you might also relieve some of the anxiety that comes with not understanding a very horrible and often slow acting disease. Researchers have found plenty of suspected links between gum disease and more serious diseases. An anesthesiologist told me that he was certain they would see less heart surgery if people cleaned up their gum disease first. He might very well be correct! * Everything I say is in general terms only, specific questions about your unique dental health situation should be directed towards your doctor for answers.